There were several people who travelled. They left London on 28th March 1873 and arrived in Moreton Bay, Queensland on 29th June 1873, sailing on the Ramsey. Rebecca Orchard (per 1851 Census born and living in Swanbourne age 15) married (1) Henry Currell (can’t find marriage?) and (2) Thomas Johnson (married Swanbourne 25th June 1871).Charles (b 22nd July 1855); Edward (b 25th March 1857); Mary Ann (1860); James Henry/Harry (1865) and George (1869). Marriage 2 – one child Stephen Abbott Ramsey Johnson born 20th May 1873 (must have been born on board ship – hence name Ramsey! birth registered as Queensland). Checking them all individually, they all were on the Ramsey 28th March 1873. Charles married (Christina Potter on 10th Nov 1881) and died (on 16th Nov 1939) both in Barraba, Australia aged 84 – they had 12 children. Edward married Mary Esther McNeill and died (2nd May 1936) in Barraba age 79 (Note: in 1871 Edward was at boarding school in Godalming and therefore not on the Census in Swanbourne with the rest of the family). Mary Ann married Francis Clarke (in Tamworth, NSW, in 1877 age 17). They had 11 children. She died in 1902 (in NSW) of blood poisoning from childbirth age 42 on 18th June (3 days after her mother). James – can’t find a marriage. Died in Barraba NSW 1929 age 64. George – can’t find a marriage. Died in Barraba NSW 1943 age 74. Stephen died in Tamworth Queensland on 27th July 1937 age 64. NOTE: Gates and Yates seem to be interchangeable!! Mary 30 42 55 63 68 Born Mary Scraggs in Quainton.Age is all over the place! James 7 18** 25 24 Ages are a bit out? Robert 6 or 4 16 26 30 Ages aren’t too bad. In 1881 Eliza Gates (Sister to Thomas Capel (Head), unmarried but name is Gates? ), living in Stewkley with her brother, age 56, also unmarried. In 1871, Robert is age 26, married to Ellen Alderman (age 26, born 1845 in Swanbourne), both living with his mother (Mary, age 68, widow, born Quainton) in Steeple Claydon. Marriage was 30th April 1867 in Swanbourne – however, just to make it difficult; Robert Gates is recorded as Robin Yates!!! James (age 24) and Robert (age 30) travelled on the Ramsey arriving in Moreton Bay, Queensland on the 29th June 1873 (same boat and date as the Currell/Johnson family!) Neither Eliza or Ellen were on that boat, as Gates, Yates, Capel or Caple! I can’t find either of them travelling to Australia later. There is a Pubic Member tree on Ancestry that says James and Ellen had 8 children. The first four are ‘private’ (i.e. no info showing) but the last four were born in Australia. Born: 12th Mar 1855 in Swanbourne, Bucks. Parents are Benjamin born 1822 in Swanbourne, and Jane (nee Prior) born 1822 in Little Milton, Oxfordshire. They had two other sons, James Henry born 10th April 1850 and William born 18th October 1852, also in Swanbourne, i.e. brothers to Thomas. 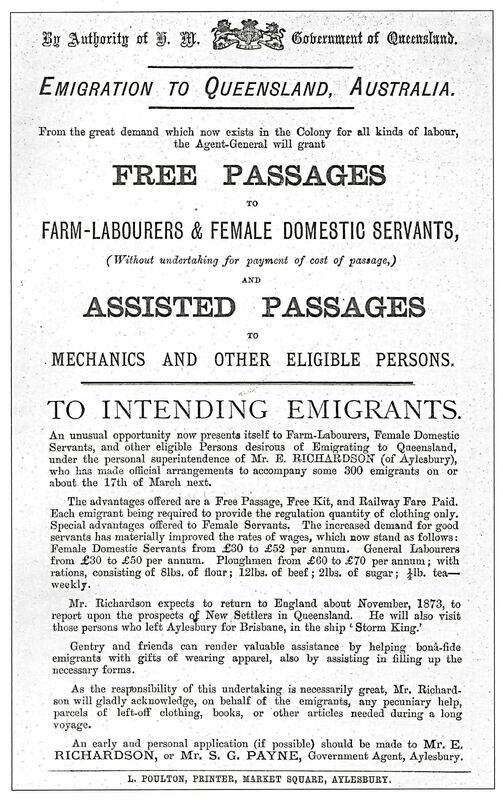 See Censuses 1861 and 1871. Married: Ann Elizabeth Steedon (1859-1916) in Winslow on 17th December 1876. His wife was then known as Eliza Gurnett. Travel: Thomas (age 24 – but he was 22?) and Elizabeth (age 26 – but she was 18?) 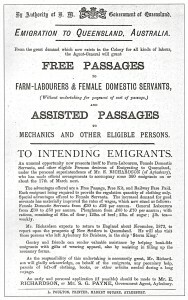 sail to Australia on the Scottish Bard, arriving in Townsville, Queensland, Australia (from London) on 21st August 1877. Thomas Benjamin, born Dec 1877, died 23rd Sept 1929 in Queensland, Australia age 52. Married Helen Theresa Kersey 5th Sep 1903. Maud Elizabeth born 1st Feb 1883, married James Patrick McNamara in Queensland age 24 in 1907, died 15th Feb 1968, Lutwyche, Queensland. Ernest Albert, born 20th Nov 1893 and died in Australia in 1977. He married Florence Louisa Johnston on 10th Jan 1914. This family did, however, return (albeit temporarily) to England. They were clearly in the 1891 Census in Great Missenden. They must have travelled back to the UK between Feb 1883 (after Maud was born in Australia) and 1891 (in UK in April), and then back to Australia again between 1891 (in UK in April) and Nov 1893 (Ernest born in Australia). I can, however, find no record of any of these four names in any passenger lists (for any dates).